1. 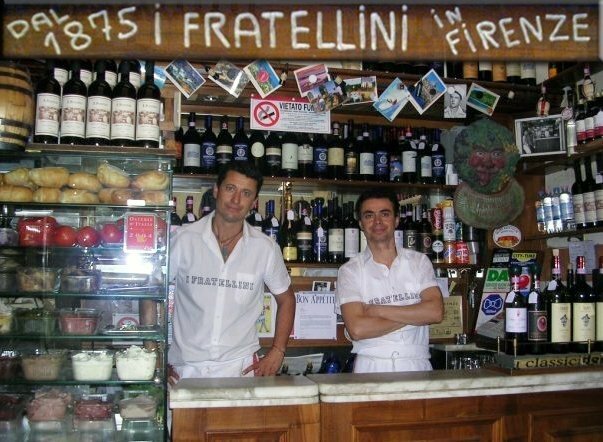 Fratellini in Firenze – This isn’t so much a restaurant as it is a literal hole-in-the-wall sandwich stand. It was recommended to me by the Italian student I sat next to on the plane (while we spoke to each other in broken Spanish), and he did not disappoint. It serves exclusively small sandwiches with stuffings that range from fresh mozzarella to fresh sausage – each boasting an unmatchable freshness. All sandwiches are 2.50 euros, so for the price and size I recommend getting two. I should also mention that they offer glasses of wine for around the same price. Great for a walking snack while exploring the city. 2. Vivoli – Nothing says “Italy” quite like gelato, and this hidden gem has been acknowledged as the best since the 1930s. I am telling you, as someone with a sensitive stomach and aversion to excessive dairy, do not miss this. Portions are great, flavors are better, and the prices are totally reasonable. I split my bowl between scoops of hazelnut and coffe, and honestly had to ask my travel companions for help finishing the whole thing. The only weird thing about the setup is that you pay first for the size you want at a separate counter, and then bring your ticket to the gelato section with your flavor requests. 3. Parione – This is where we had our “nice dinner” out for the weekend, by the recommendation of my friend’s uncle. I can’t say enough good things about the service, food, and wine. After speaking with the owner about the restaurant’s reputation, we were seated in a cozy corner of the downstairs and waited on respectfully and promptly – despite the fact that we were three 20-somethings on a budget. We split a bottle of deep red wine and tried each other’s entrees – ravioli in a parmesan sauce, some variation on a margherita sauce, plus an order of wild boar – and finished the meal with two orders of their infamous cheesecake. The whole thing was to die for, and the owner ended up removing the wine charge from our bill. If I’m ever back in Florence, I’ll be back. 4. Zaza – I should start by clarifying that the service was fine at best. Six of us were seated in an area near the outdoor smoking section, so we were slightly bothered by the smell throughout our dinner, but I think we were only seated there due to the size of our group. We also had a hard time initially getting the waitress’ attention for water, bread, etc. That said, I should also mention that the food and prices were outstanding. More pasta, some salad, and more meat. Servings were generous, but not overwhelming, so I recommended splitting two or three between a small group. It’s a great (and pretty well-reviewed) place for a cozy dinner with friends and family. 5. 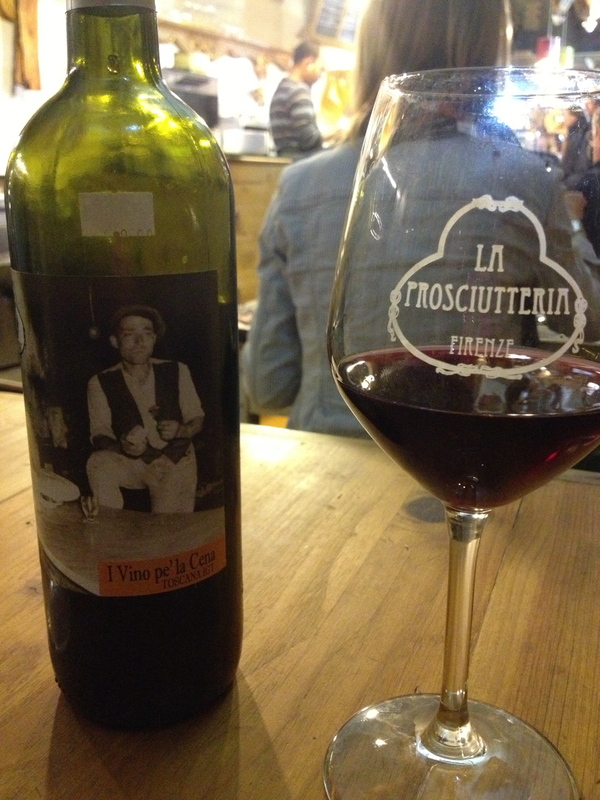 La Proscuiterria – Unfortunately, I couldn’t find a website, so the name is linked to its (excellently reviewed) trip advisor page. It’s another hole in the wall – seemingly attended mainly by Florentine natives and Italian tourists. 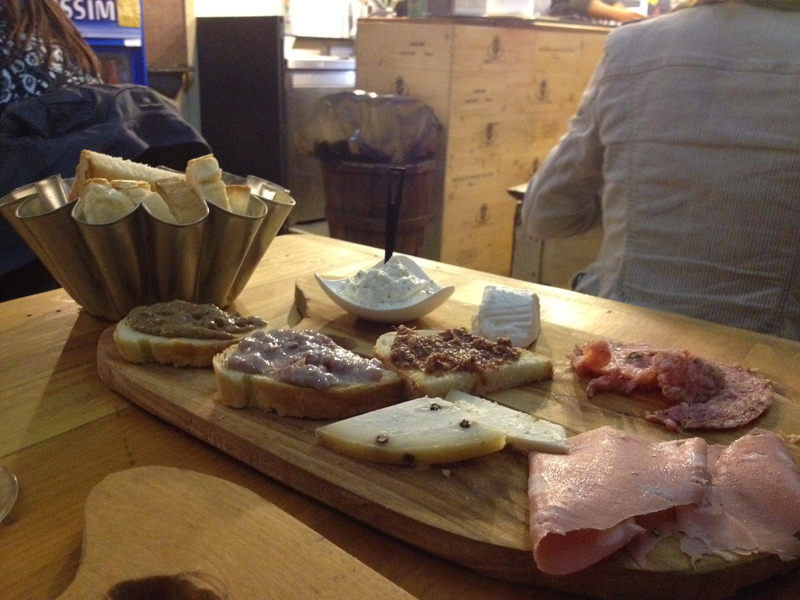 When you order, you’re essentially ordering sandwiches or platters of meat and cheese. You pay for wine based on how much of a bottle you consume, and the walls are lined with locally made pastas, sauces, and drinks. We had a delicious lunch on our way out of town, and still bought two bags full of peppers, pesto and pasta. 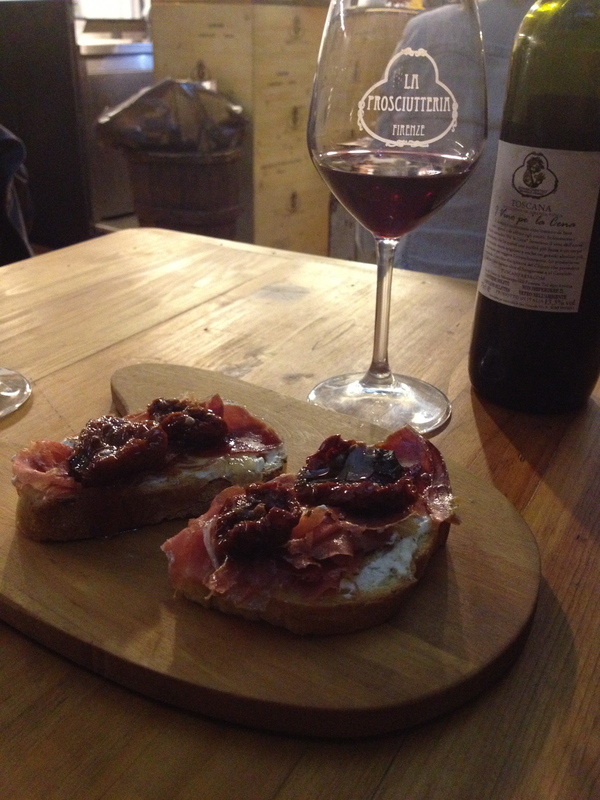 Overall: inexpensive, delicious, non-touristy and a great time. This weekend was surprisingly hugely successful in terms of shopping. While the intention was to stay at home and do all my work for the next two weeks, instead I ate at all my favorite restaurants, shopped at my two favorite places, and enjoyed the company of my many favorite people. 1. Max a Mia: Jake (boyfriend) and I come here for special occasions when we can afford to splurge a little. Between the incredible garlic bread, delectable and sizable entrees (try the stone pies and pasta dishes! ), and Bocci Ball dessert…it’s totally worth it. This time, though, I went with my parents and enjoyed a nice, long, paid-for dinner. Love. 2. The Village Restaurant: Owned by local couple Greg and Denise Raap, The Village boasts the title of “Best Neighborhood Restaurant” by CT Magazine and has earned a stellar recommendation by Zagat. The prices are completely reasonable, especially if ordering off the “Pub Menu,” and you can’t beat the atmosphere. Good for your wallet, your stomach, and your attitude. 3. Cugino’s: This was actually an accidental find after Jake and I started searching for a new “night out” restaurant. As college students, our wallets are only so deep and eating gets expensive. Cugino’s has an excellent early bird menu; select entrees $12.99 from 3-6 p.m. Yum. I had a field day at Marshall’s, Anthropologie and the flea market this weekend. Having recently discovered the Marshalls chain had a location in affluent West Hartford, I spent one afternoon moseying through the store and picking my favorite items…like this Philosophy Purity one-step facial cleanser for $9.99. This was especially exciting since I’ve been looking for something to replace my usual Clinique Liquid Facial Soap; three years of use has made my skin slightly resistant. Also, remember how excited I was when I discovered my love for Lollia? 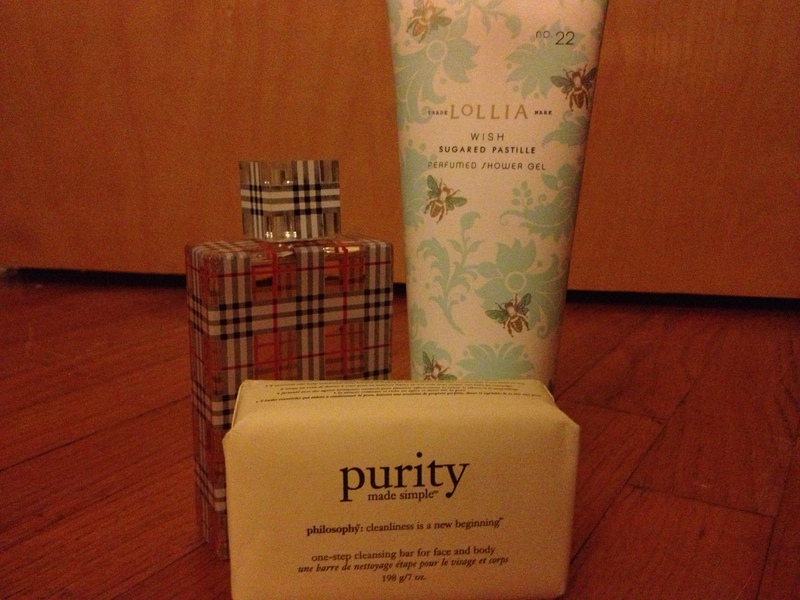 Well at Anthropologie, I picked up a clearance bottle of this perfumed shower gel! It’s comparable to something made by Fresh, but the price tag is slightly more reasonable at a mere $9.99. And it smells SO GOOD. I think they also had it in No. 21: Calm, but I preferred the scent of the former. If you have an Anthro nearby: Go. Immediately. Right now. Or else risk missing out on one of the best products I have ever purchased. I wrapped up my weekend by spending a few hours with Jake’s mom at the local flea market. And by “local,” I mean “an hour away.” Regardless, I picked up this questionably sold bottle of Burberry Brit for $16. I’d been eyeing it for almost a year and never felt the need to spend the $75 it previously costs. Oh-so-cheap and oh-so-yummy. Win-win.